At some point in Fire Emblem, you will have to make a difficult decision--life or death? Will you reset a mission to save a character, or will you count them a casualty of war? It's a more pressing dilemma than you might think, especially after resetting a mission for the umpteenth time. Permanent death has been Fire Emblem's calling card since its inception, and that's no less true in Awakening. It's for that reason that Fire Emblem has a reputation among gamers for being brutal, which is not entirely un-deserved. However, the 3DS version does its share to mitigate the frustration for newcomers, and it would be a shame to miss one of the franchise's best entries in a while. At its core, Fire Emblem is a traditional turn-based strategy RPG that puts more emphasis on battlefield tactics than raw customization. Maps are elaborate affairs with lots of obstacles and barriers, such as volcanos in which the floor dissolves into fire and burns player characters. At times, they can feel almost like full-on dungeons, complete with traps, keys, and treasure. "...Fire Emblem is a traditional turn-based strategy RPG that puts more emphasis on battlefield tactics than raw customization." 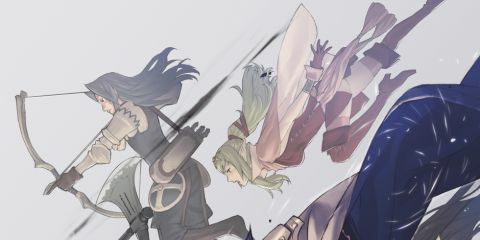 Awakening doesn't deviate too much from these strategy tropes, but it does modify a number of fan-favorite features from Fire Emblems past, while introducing a few of its own. Chief among them is that players now assume the role of the Tactician. A more fleshed out version of a class introduced in Fire Emblem on the GBA, the Tactician is now a fully-customizable player character who supports the protagonist Chrom. This proves to be an interesting move, as support relationships feel more personal and character gender becomes more than an aesthetic choice. The Tactician could have been little more than a support role, but Awakening goes out of its way to weave the player character deep into the fabric of the story and the individual relationships, and the game is better for it. Unfortunately, these relationships are dragged down just a bit by the comedy, which is inconsistent at best, and downright grating at worst. The laughs tend to be rooted in such time-honored anime tropes as: "I accidentally walked in on a female character while she was showering! Hilarity ensues!" Granted, some of the characters can be good fun, like the sarcastic dark mage Tharja, but others are either stiff (Frederick) or flat-out annoying (Vaike and his constant references to himself in the third-person). All told, the cast is decent, but not especially memorable outside of the main characters. On the field, however, it's a different story. While some characters are more powerful than others, pretty much all of them are useful in their own way. And in the grand tradition of Fire Emblem, relationships matter a great deal on the field. As you might expect, a husband and wife team tends to have better synergy than most, which results in crucial stat boosts when attacking and defending. Typically, these stat boosts are the difference between victory and having to reset the game. "The impact the relationships have on both the storyline and the actual strategy end up being Awakening's biggest strength." In a nice touch, it's now possible to pair characters together, which makes it that much easier to get a little magic going (if you catch our drift). At first blush, it's a tad overpowered, since it can often result in characters landing three or four strikes on a single foe. But Awakening compensates by loading up the maps with a lot of high-level enemies in the late going, which can overwhelm even a really strong pairing. As such, while every group has the potential to deal a huge amount of pain, no one is invincible, especially on the harder difficulty levels. The impact the relationships have on both the storyline and the actual strategy end up being Awakening's biggest strength. They allow otherwise flat characters to grow a bit, and they make for some interesting combinations on the field. Supports have been part of this series for a while now, but they really find full expression in Awakening thanks to the personalization provided by the Tactician and the children. Awakening manages to impress in other ways as well. Rather than offer a strictly linear progression, the game has a full-fledged world map, which includes multiple sidequests and enemy encounters. These sidequests are important for building relationships and advancing characters, and oftentimes they are nice simply for being a change of pace. They are numerous, and the maps are almost as deep as the campaign missions, which is great to see in this kind of optional content. Best of all, enemies match your party’s level in the main campaign, so there's no need to worry about over-leveling and ruining the balance of the difficulty. "Awakening ends up being the first entry in a long while to really nail the franchise's formula." Awakening also does a great job of implementing the Nintendo 3DS' Street Pass functionality. After passing a fellow Fire Emblem owner, their Tactician will appear on your map, along with their party. You can then challenge them to a battle, and if you win, your friend's avatar will join your squad. It's a neat, if not particularly useful, addition. Outside of the sometimes hammy and overly-confusing story, there's really very little "wrong" with Fire Emblem. Even those who are turned off by the notion of permadeath can simply opt to use the new Casual Mode, which can used for any difficulty and makes it possible to save at any time. The presentation is very nice; the soundtrack makes use of rich choral melodies for tunes that sound appropriately epic; and the anime-style cutscenes are strikingly attractive. While the total run-time of 15-20 hours is shorter than other entries in this franchise, there's a good chance you will want to start again immediately, if only to see what you get when you pair up different party members while playing on a harder difficulty level. Description The latest game in the Fire Emblem series for the 3DS.